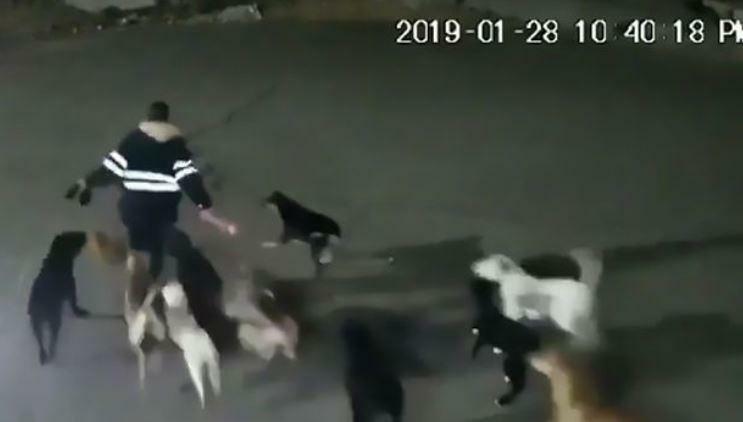 DISTURBING footage shows the moment a woman was chased by a pack of 11 dogs before she was mauled to death. The woman, named as 34-year-old Margarita N, had her scalp ripped off as she was torn apart by the animals in a Mexico street, according to local reports. CCTV footage shows Margarita sprinting in terror as the dogs chased after her. The ferocious attack was not caught on camera as Margarita ran out of view before she was bitten by the pack. According to local reports, she was found with large parts of her skin torn off and with chunks of her hair and scalp ripped out. The toll booth worker was reportedly crossing a waste ground on her way to work when she was attacked by the dogs. The animals were medium-sized and are thought to have attacked because the woman had strayed into their territory. Police are looking into the case and have not ruled out the possibility that the dogs were set on the woman. The mayor instructed members of the Control and Animal Welfare Centre to visit the scene and track down the animals.